It is finally Fall. I love everything about Fall. I love the weather, watching the leave change, spending time with family and knowing the holidays are right around the corner. Oh ya and who doesn’t love everything pumpkin? I know I do especially in the Fall. This Pumpkin dessert is so delicious and so easy to make! I have made it for small groups or large group and it has been a crowd favorite. We love all things Pumpkin when it is Fall. There is something about the season that makes pumpkin taste so good! This is one of my favorite pumpkin desserts. I am going to bring it to our families Thanksgiving dinner and I can’t wait to see what my family thinks. I have shared one of my favorite recipes for Fall but whats yours? Share your favorite Pumpkin or fall recipe with us so we can try out your delicious treats!! I can’t wait to hear back from you guys! This Easy Pumpkin Roll Dessert from Yummy Healthy Easy is the absolute perfect way to celebrate Fall! Jen’s recipe is easy to follow and amazingly delicious! She says this is super easy and you can make it ahead of time before an event or any meal. Everyone will love this dessert you can count on that! Make sure to let us know what you think. Happy Fall and thanks for reading our post. We love all your comments and look forward to sharing more recipes with you guys really soon! Thanks. 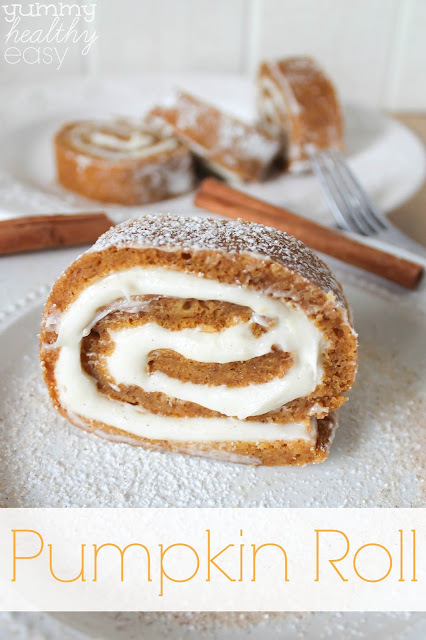 Head over to Yummy Healthy Easy for the full Pumpkin Roll Recipe. This looks so pretty for fall and yummy, too.